If you think you don't need to test your soil just because you have been gardening for years, think again. Soil changes over time due to the plants you grow and the nutrients you add to the soil. Changes may go unnoticed because they occur gradually. The University of Maine Extension Office recommends testing your garden soil every three years to assess nutrient levels, pH and the percentage of organic matter in the soil. Where do I get my soil tested? Your local cooperative extension service provides soil testing for a minimal fee. Contact the office closest you and request the soil test kit. Fill out all required forms and return the soil test to the soil testing office. Can I test my soil myself? Inexpensive soil test kits purchased in the hardware store provide a quick analysis of your soil and provide the levels of vital nutrients in the soil. They do not analyze the amount of organic matter or the presence of trace elements. Home tests provide a quick pH level. 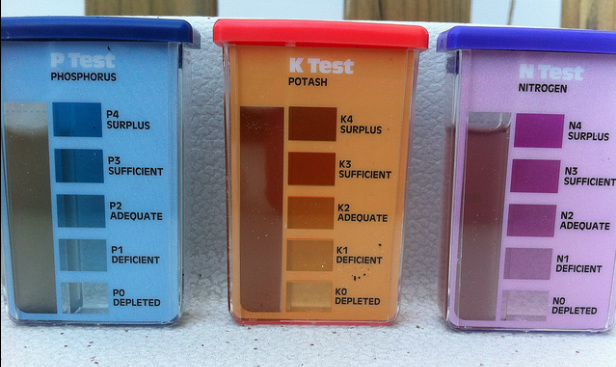 For a quick check of pH levels or a quick look at the nutrient balance in your soil, home tests are fine. For more in-depth information, consider a soil testing service. Isn't adding organic matter every year enough? The nutrient balance in organic matter varies. Although it is a good soil conditioner and improves both drainage and water-holding capacity, organic matter can alter the nutrient level of your soil. Manure high in nitrogen may raise nitrogen levels beyond the desired level, while those with wood products may rob your soil of nitrogen as they decompose. You should test your soil regularly to assess how organic matter is affecting the nutrient levels and pH of your soil. I use a balanced fertilizer, why do I need to test my soil? Again, soil changes over time. The crops you grow may delete nutrients causing the soil to need more than the traditional application of fertilizer. An imbalance of nutrients may occur making the traditional 5-10-10 or 10-10-10 fertilizer the wrong formula for your garden. When is the best time to test and amend soil? Testing the soil in the fall allows you to amend the soil months before planting. This gives soil amendments time to make the necessary changes to your soil. If possible, testing and amending soil in the fall is the best choice. Otherwise, test in early spring and allow amendments to work their magic for a long as possible before planting.